One of the most unintuitive elements about 5G naming is that it is actually covers two very distinct sets of frequency bands, each of which has its own difficulties and benefits. I want to cover them here, just in case any readers are new to this market. The first set of frequencies is called ‘Sub-6’, which is short for ‘Sub 6 GHz’. This covers all the frequency bands below 6 GHz, which could separately be split down into frequencies below 5 GHz in licensed bands, and between 5 GHz and 6 GHz in unlicensed spectrum. This mode of 5G is the easiest to implement – it requires less complex antenna arrangements, and it also travels the furthest distance. Sub-6 can be considered an extension of 4G/LTE and is essentially the base layer for stand-alone 5G as a whole. As a result it will be the first to be deployed in most markets. (Note, you will see ‘Sub-6’ written with different capitalization and dashes depending on where, just like Wi-Fi). The second set of frequencies is called ‘mmWave’, because the wavelength of these signals is on the order of millimeters. This is actually in a frequency range from 26 GHz to 40 GHz, and is a lot harder to implement – it requires specialist antenna tuning, and it offers very limited penetration of walls and other line-of-sight obstructions (humans included). Nonetheless, it offers the highest speeds and supports the most users simultaneously – think high-density urban environments, or events such as concerts or sports arenas. Due to the demands of mmWave, this will generally be rolled out later in time, and is likely only going to be focused in major cities – at least to begin with. While using mmWave, LTE enabled devices are expected to also be able to use LTE at the same time. It is going to be interesting to see which modems and which devices will support which set of frequencies, and within those, which bands for specific markets. If you got tired of trying to work out what different LTE bands are supported in your area / by a specific device, then get ready for another decade in the world of 5G. There are likely to be many more in development beyond these, as well as several that could have been announced but are region-specific or market-specific. 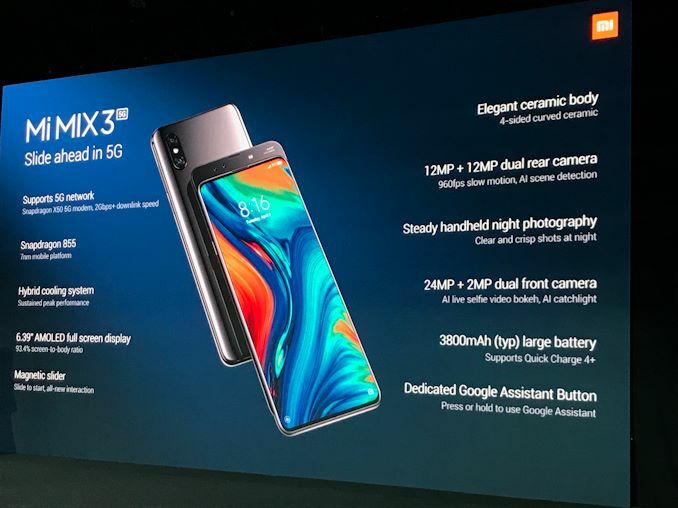 However at least six of these above are going to be in most of the 5G devices that the western markets are going to use. Announced with big fanfare, the Snapdragon X50 modem from Qualcomm will typically be paired up with the company's Snapdragon 855 smartphone SoC to provide the core of many 5G enabled smartphones we see in 2019. 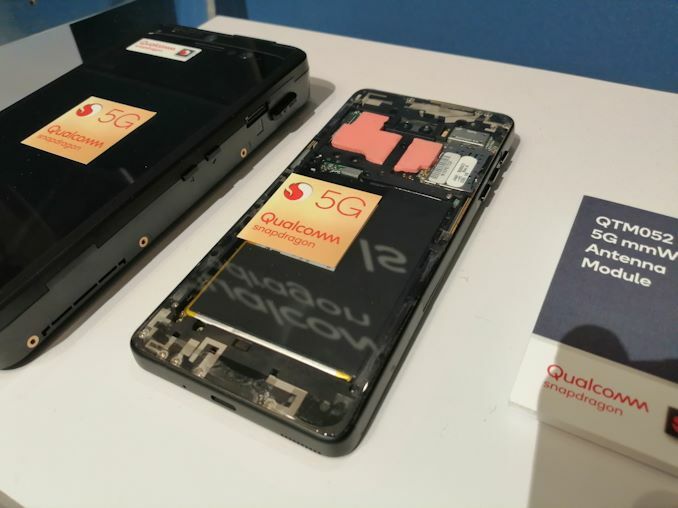 At Qualcomm’s Tech Summit in December, we saw the company showcase its 5G reference design smartphone device, built for both Sub 6 GHz and mmWave functionality. In order to enable mmWave on this reference design, Qualcomm used three of its mmWave antenna modules in different orientations (human hands block mmWave rather well), which made the device a good 2-3mm (1/8th of an inch) thicker than the flagship LTE devices we see on the market today. With that in mind, it would be worth considering that as Sub-6 GHz infrastructure is going to be deployed first, we may see devices that only support sub-6 GHz bands for this reason. However, it will be up to the device manufacturers to decide what to support. 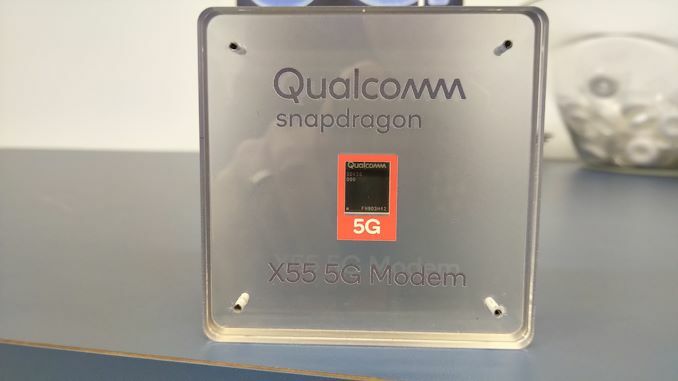 It should be noted that when asked, Qualcomm stated that in order for the X50 to work, it has to be paired with the Snapdragon 855 due to some of the control mechanisms and DSPs being used on the SoC. 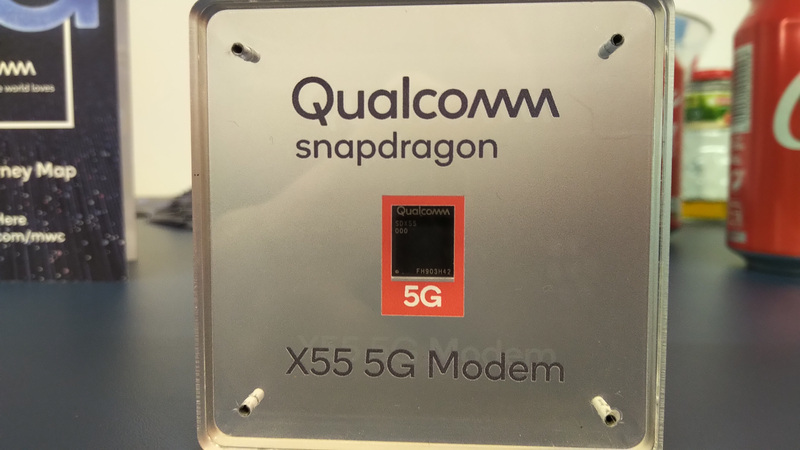 The big issue for Qualcomm’s first generation 5G modem is that it doesn’t have full support of some parts of the standard. As such, it won’t be able to support future SA (standalone) networks, and also lacks support for FDD frequencies or the 26GHz mmWave bands which will be important in many areas of the world. Thus we expect X50 devices to have similar limited release windows as the first 4G phones had nearly 9 years ago. The X55 is still a member of the same family; however this modem looks as if it does not require a partner SoC. 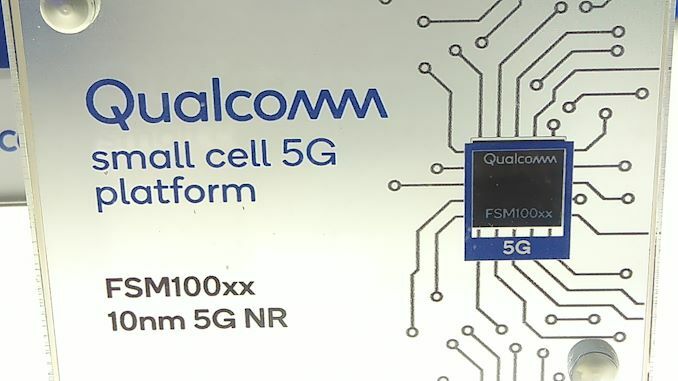 This modem will form the basis of the M.2 modules that Qualcomm’s partners are producing for their non-end-point devices, however we will see it in laptops in the future when paired with the Qualcomm Snapdragon 8cx, which is the company's higher-powered SoC for ‘always connected PCs’. The X55 also resolves the compatibility issues of the X50, and here we have a seemingly full future-proof solution that looks to be compatible with 5G networks years down the line. 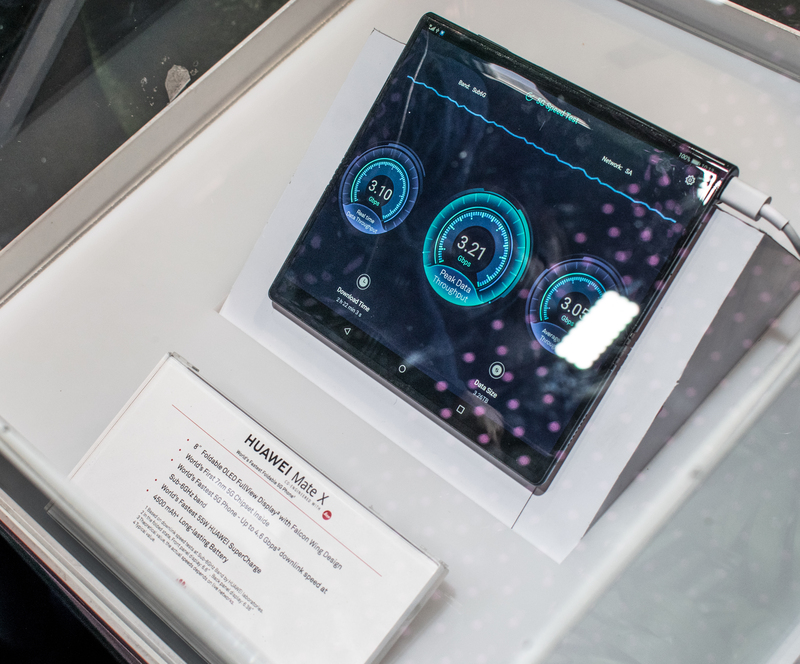 One of the bigger announcements around 5G deployments was that Lenovo announced it was committing to building a high-end laptop with the Snapdragon 8cx and the X55 modem. One of the biggest markets that Qualcomm is looking to get into this year with its ACPC programme is the commercial market, and scoring a win with Lenovo in something like the ThinkPad would really put the concept of ACPC out to tender, to see if it is a success or not. This works in well with Qualcomm’s push to make the ACPC concept more amenable to software focused on commercial users. The X55 modem however looks set to be used far and wide beyond the smartphone market. This modem is in this list purely because we saw it at the Qualcomm booth at Mobile World Congress. 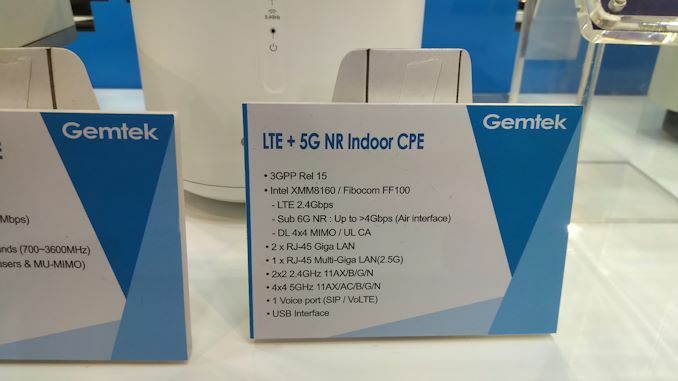 In its casing, it is listed as a 10nm 5G modem entirely focusing on ‘NR’, or ‘New Radio’. 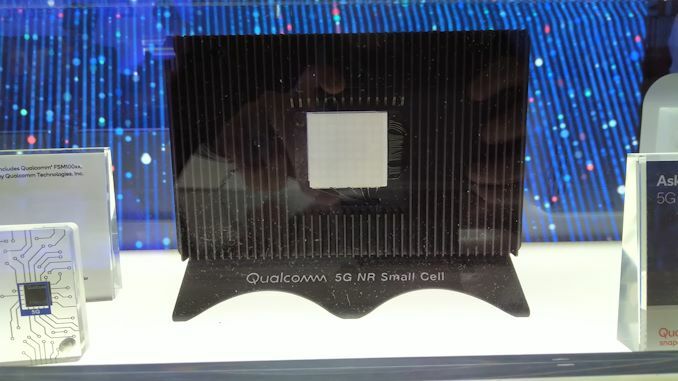 This is a software defined modem that was first announced by Qualcomm last year, and is aimed at the 'small cell' and remote radio head markets. Next to this modem was an example of a small cell, which is expected to be deployed as part of the infrastructure to help enable other 5G devices to connect to networks. On the small cell device we could only see the back; however the 8x8 antenna array was clearly visible. The FSM100xx seems to be a more infrastructure based modem deployment, so we might also see this pop up in 5G CPEs or access points as well. Intel made a lot of fuss about its LTE and 5G capabilities in 2017. So much noise was made back then that in 2018, it turns out that at AnandTech we didn’t write one thing about the modem. So despite winning the contract to power Apple’s iPhones with LTE modems last year, not a lot has been said about how well the company’s 5G exploits are doing, except for showcasing demonstrations and how 85% of my inbox seems to be peppered with Ericsson/Intel news about how they successfully tested ‘5G at 4.4 GHz’ or ‘5G at 4.45 GHz’ or ‘5G at 4.46 GHz’ or several emails about things equally banal. Nonetheless, news about Intel’s 5G starts at Mobile World Congress. The company has continued its partnership with Fibocom to develop modules with Intel modems onboard. For the past few years, Fibocom has been making modules with Intel’s LTE modems, but the announcement at MWC is that Fibocom will produce an M.2 module with Intel’s XMM8160 inside. We saw the module on the show floor; however it was covered up with an EMI shield so we couldn’t actually see the modem chip itself. In speaking with the Fibocom representative, we were told that they expect the module to be ready in 2020, and they’re waiting on hardware, software, and the ancillaries to be ready. So, pretty much everything then. Intel did state that it was working with Skyworks in order to do the front end for Sub-6. With all that being said, Fibocom did show off some CPE hardware as an example of where this module is to go, and stated that they are working with HP, Dell, and Lenovo to equip 2020 notebooks with the XMM8160. Fibocom also had documentation showing the full band support for the module they were making with Intel’s chip. However as of yet, no company has announced they will be producing a 5G device with Intel’s modem. Some money is on the prediction that Apple will use Intel for its 2020 5G-enabled devices, however that remains to be seen (given suggestions that Apple is building its own modem team). For anyone with a Huawei device, especially a mid-to-high end device from the past few years, then you have been using ‘Balong’ modems for a good while. Huawei’s modem capabilities have grown in leaps and bounds in previous years, and the company was keen to show off its modem at Mobile World Congress – at least by appointment only. Huawei is a company that spans both consumer business and a big chunk of the world’s mobile infrastructure, so it will no doubt be a key player over the coming years (depending on which governments let it in). 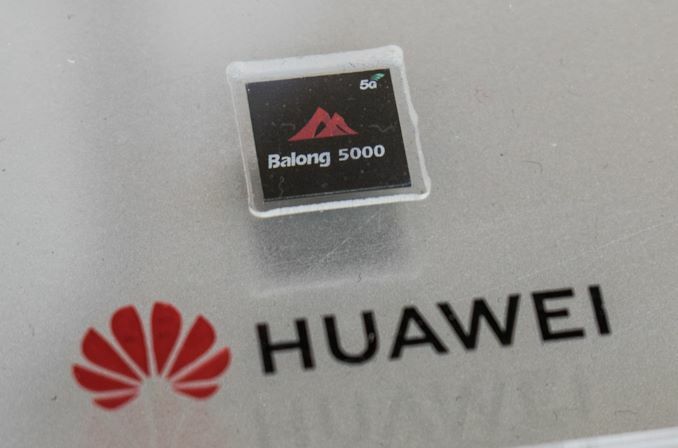 For consumer deployments, Huawei’s first modem will be the Balong 5000. This is a full multi-mode chip with NSA and SA capabilities, and Huawei says it expects to be fully compliant with the 3GPP Release 15 standard (this is the one that matters with consumer 5G). It will also support a good amount of the LTE spectrum. For 5G at Sub-6 GHz frequencies, the Balong 5000 can enable 2x carrier aggregation over 100 MHz bands, enabling up to 4.6 GHz download and 2.5 Gbps upload. For future mmWave deployments, the modem can support up to 6.5 Gbps download, and 3.5 Gbps upload. When combining mmWave and LTE, Huawei says it can achieve up to 7.5 Gbps download. Huawei has already announced that its upcoming foldable smartphone, the Mate X, will be 5G enabled via the Balong 5000 modem, paired with the Kirin 980 chipset. We expect that Huawei’s next-generation flagship smartphones, perhaps a model of the P30 set to be announced at the end of March, or the Mate 30 series later in the year with an updated Kirin, will also get the Balong 5000 treatment. The new Exynos Modem 5100 was announced last summer, and Samsung proclaimed it as the first multi-mode modem in the industry. On paper, the modem supports all necessary standards, both in legacy networks as well as new 5G NR standards, both in sub-6 and mmWave. The issue with always with Samsung is that they’re exceedingly secretive about their plans. The Exynos Modem 5100 was demonstrated back in December when Korean carriers first activated their 5G networks in the country. I’m sure Samsung showed off more at CES and MWC – however both behind closed doors (Supposedly they first showed off their 5G modem at MWC 2018…). 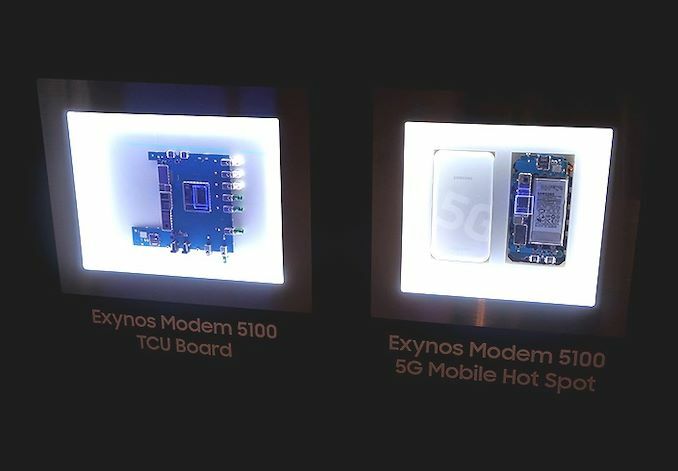 We expect the Exynos Modem 5100 to launch in 5G Hotspots as well as Samsung’s Galaxy S10 5G in certain markets (likely Korea first). Korean carriers are planning their commercial 5G network launch at the end of March, so it’ll be interesting to see if we’ll indeed see the chip inside of some of the first 5G devices. Never heard of UniSOC? This company was formerly known as Spreadtrum, and has played a lot in the low-end SoC market for emerging markets. If you purchase a sub-$100 smartphone today, it likely has a Spreadtrum / UniSOC processor inside. Up until February 27th, the company had a joint agreement with Intel to help develop 5G modems for emerging markets; however that collaboration is now officially over. 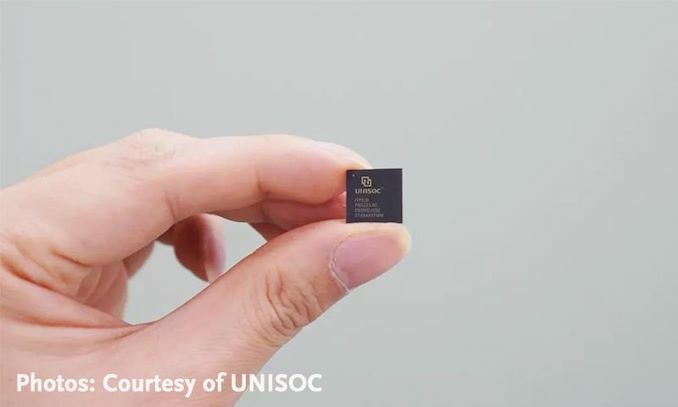 On the same day, UniSOC announced its own 5G modem, which could potentially be related. The first product is the Ivy510 modem, part of the company’s new Makalu family. Makalu is the name of a tall mountain, which just happens to be slightly taller than the ‘Balong’ mountain that provides the name for Huawei’s modems. 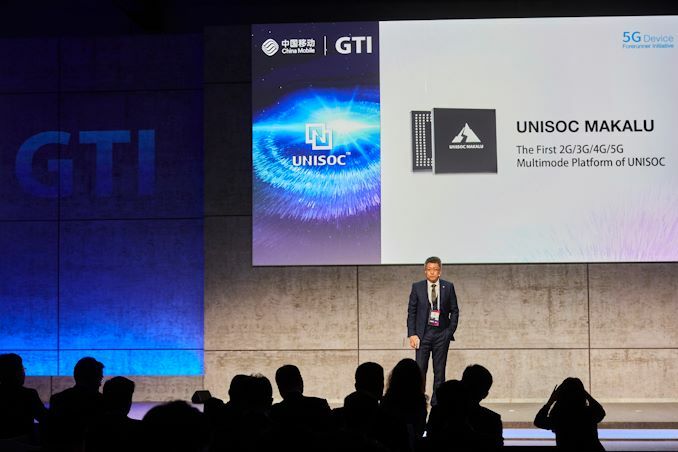 It would appear that Huawei (or more specifically, HiSilicon) and UniSOC have had some employees jump to the other side in recent quarters, fueling a bit of a rivalry. The Ivy510 is going to be a multi-mode modem, built on TSMC’s 12nm process. UniSOC states that the modem will be 3GPP Release 15 compliant, and support both SA and NSA network configurations. The press release from UniSOC states that the modem is targeted at smartphones, CPEs, Mi-Fi devices, and IoT. If previous experience regarding Spreadtrum devices is any indication, we may expect to see the Ivy510 in mid-range devices for China and emerging markets. A timeline has yet to be set for deployment. Also on display at Mobile World Congress was MediaTek's helio M70 modem for 5G. With MediaTek being a strong player in the mid-range markets, it is highly likely that we should expect to see this chip in the mid-to-high handsets; whether those handsets will be paired with a MediaTek SoC is another question. The modem at the booth was paired alongside an Alcatel Mi-Fi device, so we might expect to see this modem appear in Alcatel's key markets first (France, Spain, Italy, etc). MediaTek advertised the modem as supporting both SA and NSA network infrastructure, dual 100 MHz channels with 2xCA with Sub-6 GHz, and up to 4x4 MIMO download to 4.67 Gbps or 2x2 MIMO upload to 2.5 Gbps. 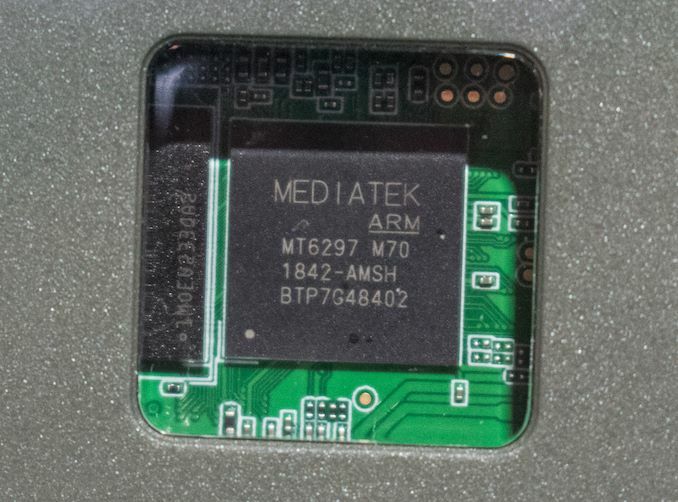 The M70 also supports mmWave – however MediaTek explains that in the markets that it plays in we won’t be seeing actual devices employ this technology till later in 2020 or beyond, at which point we’ll likely see the chip’s successor released. I’m Making a 5G Device: Who Should I Choose? Ideally I’d love to give you a breakdown of each modem and its capabilities, size, power draw, etc. But this information on most of the parts is likely reserved for internal partners, or in the case of Huawei, it will likely only sell it to itself. The important elements here are compliance with the specifications: 3GPP Release 15 is the big one in terms of end-user deployment of 5G-enabled hardware, while Release 16 is more geared towards low powered devices. We’re not expecting finalization of Release 16 until the middle of 2019, however most vendors are keen to promote that they expect to be compliant with the standard. One of the issues here though is the optional aspects of the standard – Qualcomm states they are supporting as many of them as possible, which could afford benefits for Qualcomm modems talking to Qualcomm access points. However the evolution of 5G is going to lay in the balance to see if different vendors will target different markets, at what level of features and at what cost. Working in a stadium (and similar such crowded venues) is not nothing! The QCOM X55 is a 2x4 antenna which is a poor man's phased array antenna (not enough elements) but well suited to stir up the activity on the infrastructure side. Without 5G infrastructure support the antenna will be dormant and the hardware a significant cost issue for the handset makers. Handset guys are seeding the market. Infrastructure equipment makers cannot make the 5G equipment cheap enough for Verizon to invest. I remember when 4G was actually fast, but that was when there were multiple competitors. Now it is just Verizon with a nationwide network of spectrum access that is capable of rolling out 5G. Enter government assistance and this market is on a tear. Watch Singapore as a bellweather for the global 5G rollout with China to follow, then the USA as laggards. The Verizon CEO should be on Trump's meeting agenda for a "stimulus package".